Artist Code: 0703. Completed Febuary 2007. Original SOLD. Water colour on Aquarelle Arches 100% hot pressed cotton rag. Unframed size 12″ x 16″. Framed size 18” x 22”. SOLD at Holt Picturecraft Gallery, September 2009. 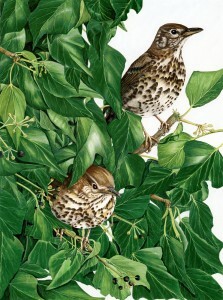 Songthrush, Turdus philomelos; Ivy, Hedera helix. My grateful thanks to Ian Dickerson whose perfectly cute photograph (lower thrush) was the inspiration behind this compilation of thrushes in ivy in January. A garden pest gone just like that! she’ll pluck and eat till all is bare.